Seeing a Heart Attacked? Act Fast! 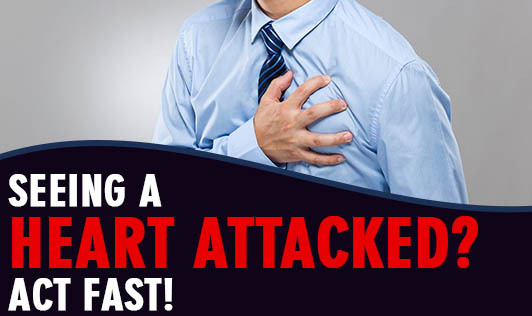 You should be very alert in identifying these symptoms especially if you know that the person is a known case of MI (Myocardial Infarction/Heart attack), Diabetes, Hypertension, High cholesterol or Obesity. If you find that the symptoms are that of a heart attack, calm down and don't panic. Act fast during the first hour of attack. It can prevent permanent damage to the heart and could save a life. • If you know that the person is not allergic to aspirin, then ask the person to chew a tablet of aspirin or crush the tablet and give it. (Aspirin is a must in every house with elderly people around). Giving aspirin to a patient under an attack can give 20-30% additional time to save a life). • In case you do not know the person's medical background, then check with an ‘Emergency Medical Personnel' on what precautions should be taken before you reach the hospital. • Check with the healthcare provider for the risk of a heart attack. Also, learn what dosage of aspirin can be given on experiencing the symptoms of a heart attack. • Keep all the health records and prescription list handy and easily accessible at the time of emergency. • Keep emergency contact numbers saved.